The story had gone viral. An elephant named Suman; Suman is a six-year-old elephant living in shackles, hidden away from authorities underground, isolated from her mother. Suman has already been through so much; she was born into an abusive circus, then sold to a notoriously cruel owner in the notoriously cruel city of Jaipur. Today she is being forced to live in a dark basement, isolated from her family, hidden away from anyone who could help. If her owner decides to employ her as a riding-elephant, men will beat her and break her spirit to make her “tame enough for work.” And she will work long, hard hours until the day she drops. 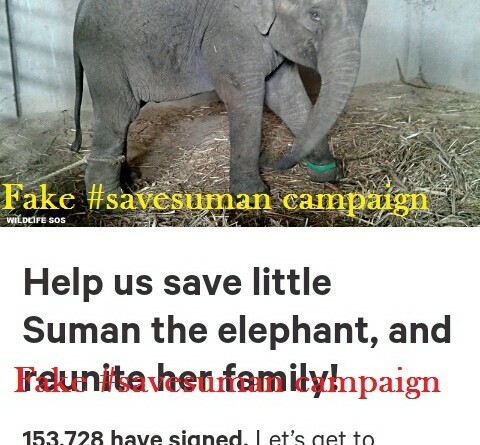 It needed expensive veterinary treatment, so the NGO well-wishers’ supporters set up a #savesuman campaign to help pay the bills. Wildlife SOS NGO is scams and fraudster. Their plan of operation is such that they will first contact you over the Social Sights and will introduce themselves as one of the Animals volunteers of the NGO and then will describe the plight of a poor Animal Rescue at Wildlife SOS. And then will ask to donate money to the NGOs account. And the biggest part is that this scam is a big matrix beyond our imagination and we won’t feel like its fake in the first look. They are able to procure an NGO certificate from Govt (authenticity yet to be proved). Their name is been listed in Govts NGO website. They have a Century which will look real in a photograph. By some spurious means, they are able to obtain the certificate of appreciation from PM & Animal rights activist. They have procured medical records of few Animals treated at other Centers. The treating doctor will usually write referral letters to medical animals welfare unit of the hospitals to find out fund for treating these Animals. They have procured these referral letters and on those letters, they themselves have overwritten that ‘the case has been forwarded to relief India Trust/mission heal for needful’. It’s all been published on their site. Most of the cases published in their sites are from Donation. When we doubt their authenticity they will ask us to come online and will show all these letters, certificates, NGO certification etc published on their website. On the first look, no one can doubt their genuineness. This is a well-structured scam based on charity. There might be many behind the scenes persons might have involved in it. Even if they are fake these people are able to obtain NGO certification from govt. They are able to obtain latest case records from anywhere. The donors don’t have much idea about the real scam running behind. Each donor is provided with case record of an animal and they are instructed to raise about $ for each case. The amount donated goes to the NGOs account but never been spent for charity. The NGO is instructed to work such that, they should make their client donate before any further suspicion on an activity of NGO arises on clients mind. They literally give you a emotional blackmail explaining the sad condition of the animals and their families.